We all need a little help in the morning. Especially on those mornings when we haven’t slept well, don’t have time to wash our hair or generally feel a little lack lustre. 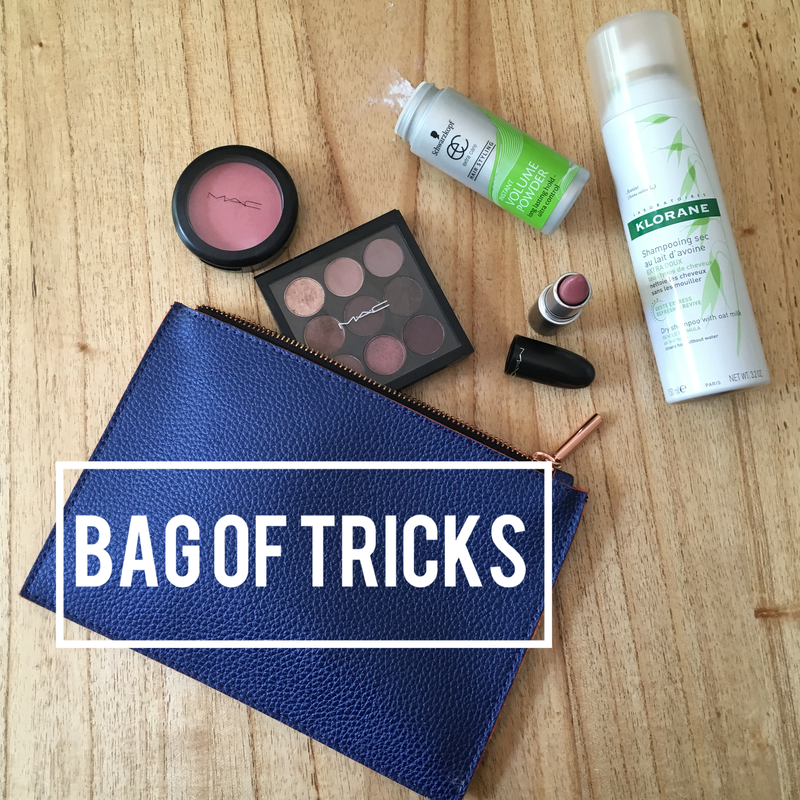 This is my bag of tricks.. products I rely on to help me emerge into society every day. I’m not sure how I got by before discovering dry shampoo. It feels like there are two very distinct periods in my life; before dry shampoo and after dry shampoo. Before dry shampoo I had to wash my hair most days so that it wasn’t a complete greasy mess. As I’ve mentioned before I have 2 children so find that time to blow-dry and make my self presentable is limited. A few sprays from this magic can and I’m grease free. I like the Klorane brand. It works well in my ash blonde hair and is available at most supermarkets; so easily accessible. A more recent, but equally profound discovery, is ‘instant volume powder’ While Dry Shampoo does as you’d expect, making your hair appear more clean than it is, ‘instant volume powder’ provides more of a post salon/ freshly styled look. A few sprinkles in the roots and you can add volume; sprinkle it along a length of hair and you can control where your hair sits. From what my Hair stylist friends tell me some are better than others so get some advice on what might work for you. When I was a new Mum and people came by to meet little Milla they would often comment on how well I looked. I maintain to this day that it was very much thanks to blusher and eye shadow. It certainly wasn’t a result of a well slept night. A gentle lashing of blusher and an application of eye shadow that compliments your eye colour, can transform you from zombie to human in a matter of seconds. I love Mac products. They have such a variety of colours and finishes that compliment every complexion. I have blue eyes so choose a Burgundy eye shadow palette and soft pink blusher for my fair skin. Professional Make up Artists favour Mac so I figure if they work for the harsh lights of film and TV they’ll be brilliant for the real light of day. Please share some of your ‘tricks’ in the comments below.